The 3rd day chasing as a guide for Silver Lining Tours (http://www.silverliningtours.com/) was a great one! We initially thought that storms would form off the Palmer Divide southeast of Denver and intensify further east towards Last Chance. Cumulus towers went up and down several times on the Palmer Divide but never could quite get going. However, storms developed just west and northwest of Denver on the mountains in the upslope flow region of the Denver Cyclone (DCVZ). 3 separate supercells developed and moved off at relatively the same time. We chose the middle storm as it looked the most intense, and this storm soon became tornado warned very early, shortly after 1:30 PM MDT! 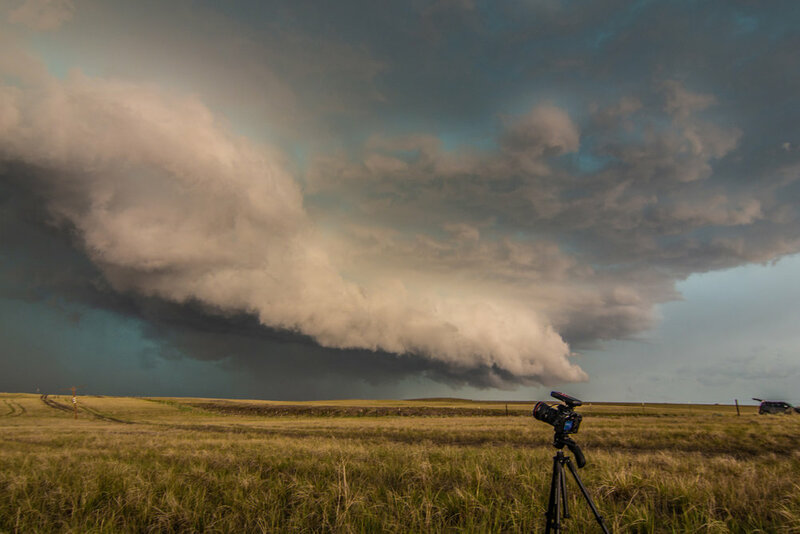 We chased the storm from near Fort Lupton over to Keenesburg where it produced an extremely photogenic tornado in Prospect Valley, Colorado. After the tornado lifted, the storm cycled a few more times but never could put down another tornado. We ended up finally leaving this storm and heading south to the tail end storm near Deer Trail. 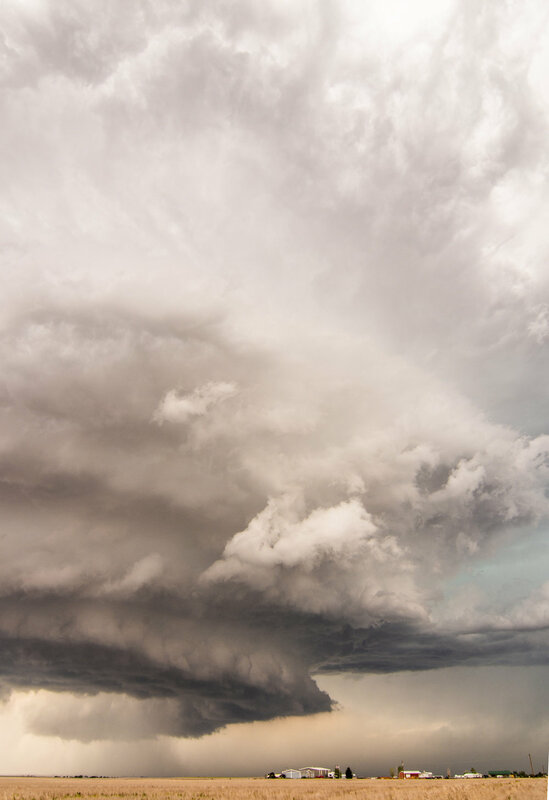 This storm also became tornado warned and quickly a high precipitation supercell with some impressive structure. We ended up chasing this storm down to Limon before letting it go as it became outflow dominant. An awesome chase day! Wall cloud on the storm near Fort Lupton as it soon becomes tornado warned shortly after 1:30 PM MDT! Storm had just moved off the foothills and intensified quickly. Massive wall cloud on this storm now just east of Fort Lupton. Terrific structure! The entire storm was rotating. Backwards C in the wall cloud indicates rear flank downdraft cutting into the back side. A wider view of the storm. Wall cloud becomes better organized and the first funnel cloud forms in the middle. Rain curtains wrapping around the entire wall cloud. Wider view of the funnel, wall cloud and the storm. I love the scenery and how far you can see in eastern Colorado! Tornado! Initially obscured by the rain but it eventually came out for us to get a great view. Amazing tornado and structure to the storm! Near Prospect Valley, Colorado close to Keenesburg. Another incredible view of the storm and the tornado as it changes shape. Incredible twisting and turning elephant trunk tornado! This was from around 2-3 miles away (estimated). 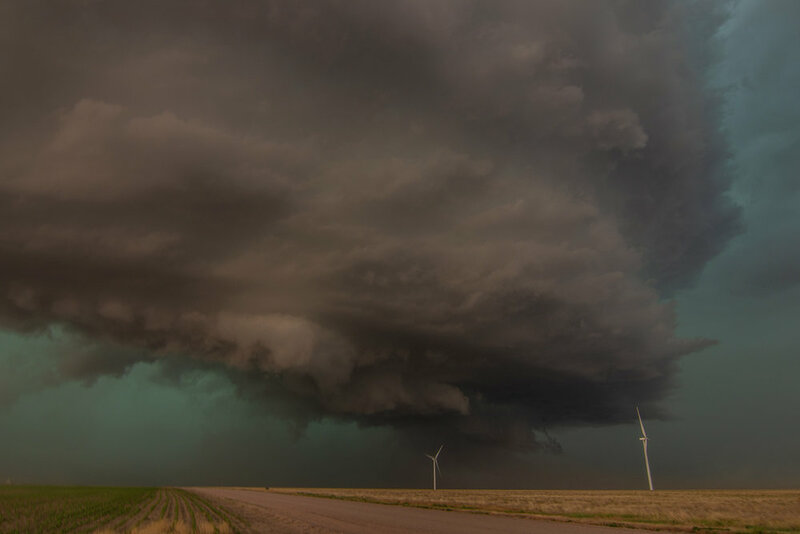 After producing the tornado, the storm continued to cycle more ragged wall clouds for another few hours. This was right when we got on the southern, tail end severe storm down by Deer Trail, Colorado. The storm was still a bit high based but had great structure. 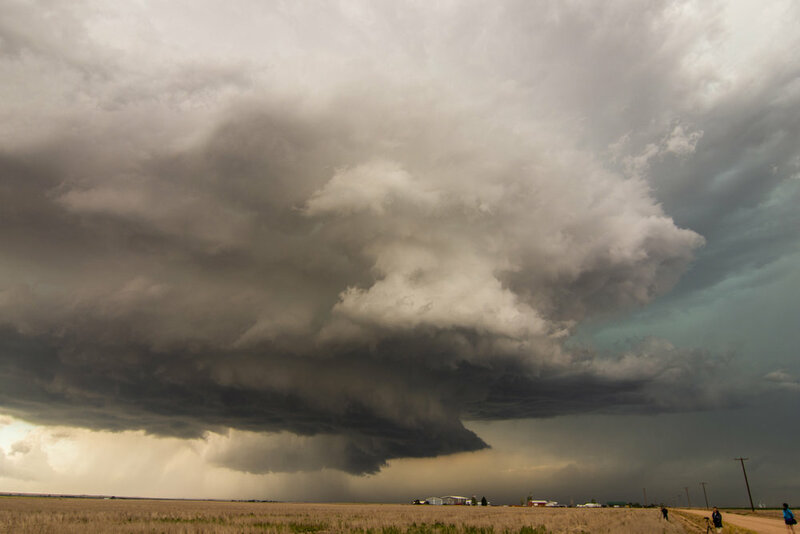 A bit more outflowish here, but the storm still had great structure and lighting near Agate, Colorado. 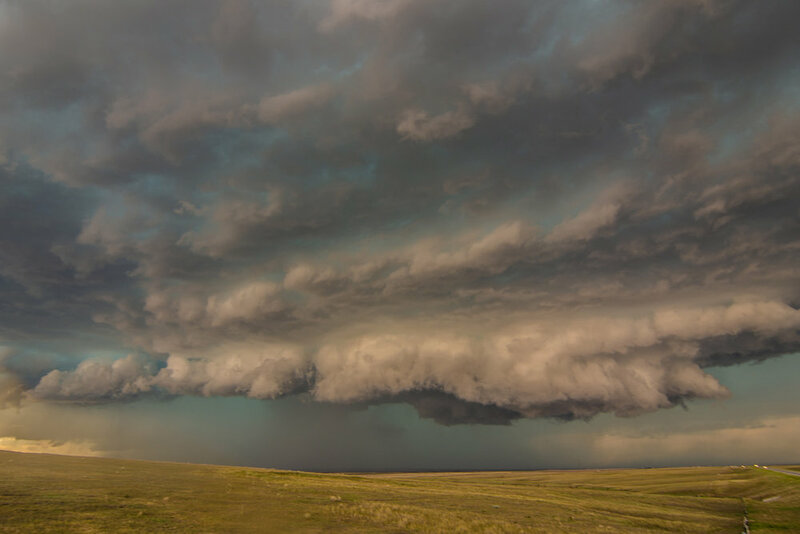 Loosely organized wall cloud to our north near Agate, Colorado. 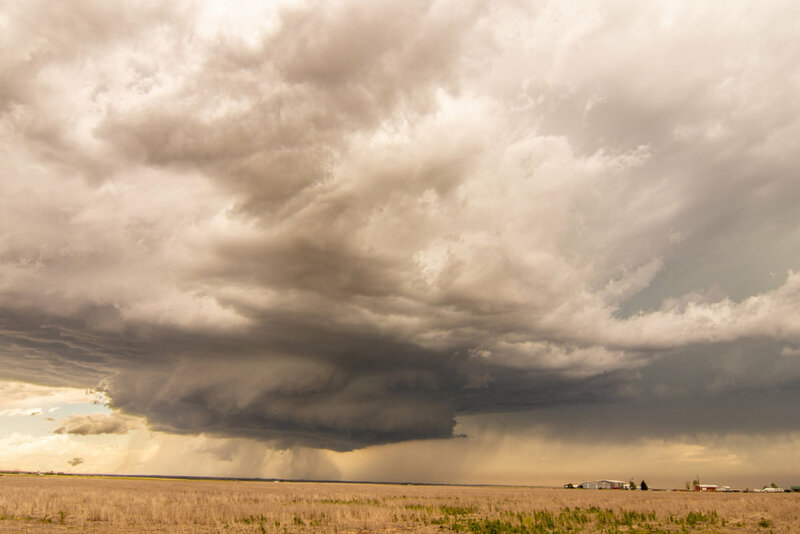 Beast of a tornado-warned, high precipitation supercell near Limon, Colorado. Shelf cloud on the storm as it rages towards us east of Limon. View of the shelf cloud, looking northwest. iPhone pano of the storm and shelf cloud. Mesoscale discussion issued at 11:48 PM MDT, mentioning the threat for a few tornadoes. Solid 50-55 knots of bulk shear across the area with 1500-2000 j/kg of MLCAPE already. Tornado watch issued at 12:25 PM MDT. Mesoscale discussion issued at 1:54 PM MDT.